This Rings Blue Gun firearm simulator mimics the size and shape of the full-size Springfield Operator pistol, cocked and locked for immediate action. Unlike the real thing, its inert design is completely safe to use, making it an ideal teaching tool for law enforcement trainees. 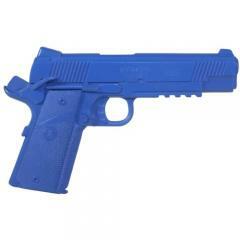 Its bright blue color distinguishes it easily from a genuine firearm. The simulator also comes in a weighted version that provides even more realism for weapon retention and handling instruction. Its durable urethane material is lightweight when unweighted, and durable enough to be used over and over again in training scenarios.